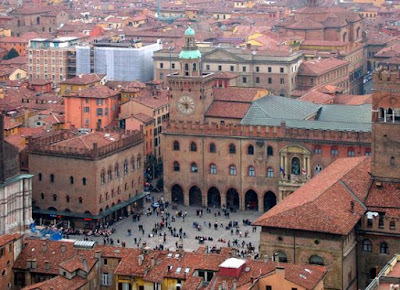 Resort Guides: Bologna tourist free - for now..
Bologna tourist free - for now..
Bologne has for too long been overshadowed by more famous Italian destinations. Bologna is now gaining a reputation as the perfect Italian city for a short break, with one big bonus — there are not yet a lot of tourists clogging up the medieval arcades. Known as La Grassa (“the fat one”) for its rich food and La Dotta (“the learned one”) for its famous university, Bologna is a cosmopolitan city with a small-town feel. A quarter of its population of about 400,000 are university students, giving the city a frenetic youthful buzz. Begin your exploration in a cafe on Piazza Maggiore — the elegant main square, lined with medieval and Renaissance palaces — admiring the view of San Petronio, one of a dozen or so spectacular churches in the historic centre. Just round the corner, past the Fountain of Neptune, where nymphs squirt water from their breasts, is the Palazzo d’Accursio, which contains a museum dedicated to the compelling still lifes of local boy Giorgio Morandi (mambo-bologna.org/en/museomorandi; £5.30). Round another corner, at Piazza Galvani 1, is the Archiginnasio (www.archiginnasio.it; free), part of Europe’s oldest university. Here you can visit the Teatro Anatomico, a spectacular wood-lined lecture hall where dissections were once one of the city’s social occasions. Across town in the Palazzo Poggi, the beautiful exhibitions of anatomical figures and foetal development at the Museum of Human Anatomy (Via Zamboni 33; 00 39 051 209 9610) suggest a 17th-century Damien Hirst. Those who find churches a bit samey should head for Santo Stefano, a complex of four medieval churches whose atmospheric starkness is the perfect antidote to Italy’s usual baroque excess. For those who prefer something a bit more cutting-edge than the 11th century, Mambo, the city’s trendy Modern Art Museum (mambo-bologna.org; £5.30), is a stunning creation in an old bakery. Evenings begin with an aperitivo. Many bars offer a free buffet of elaborate hors d’oeuvres, which budget travellers can vacuum up in lieu of dinner. Try Caffe Zamboni (Via Zamboni 6; caffezamboni.it), where a glass of wine costs £5. At the wine bar attached to the world’s best deli, AF Tamburini (Via Draperie 2), you’ll pay £11.50 for a glass of wine and a platter of prosciutto. The quality of local ingredients, from parma ham to parmesan cheese and balsamic vinegar to mortadella, is one reason why Bolognese cuisine is regarded as the best in Italy. For dinner, don’t miss tortellini with butter and sage at Anna Maria’s (Via Belle Arti 17/A; www.trattoriannamaria. com) — paradise for £11.50. Nu Lounge (Via dei Musei 6) is the hippest cocktail bar in town — grab a table in the loggia outside for serious posing. Students and bohos may prefer the grungy La Scuderia, on Piazza Verdi, with cheap drinks and boisterous international company. Ardent clubbers should move on to Kinki (Via Zamboni 1; www.kinkidisco.com). More sedate visitors may prefer opera at the Teatro Comunale (Largo Respighi 1, tcbo.it), one of the oldest opera houses in Europe. Or there’s jazz to be found at the atmospheric Cantina Bentivoglio (Via Mascarella 4/B; www.cantinabentivoglio.it).